McBryde Oil Company supplies a complete range of high-performance oils & lubricants to satisfy the needs of a wide array of customers throughout Central Texas including Kerrville, Junction, Boerne, Fredericksburg, Bandera, and more. Our lubricant product line includes all major brands to fulfill the strict and unique demands of today’s industries, including industrial, commercial, automotive, agricultural, construction and aviation applications. 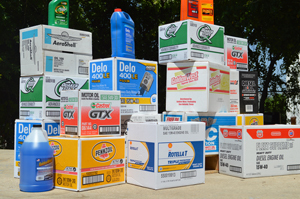 We sell and deliver oils & lubricants in different sizes, from quarts to 55-gallon drums, to keep your heavy-duty machinery running smoothly and efficiently. You can count on McBryde Oil Company to provide the oil and lubricant solution that’s right for your vehicle. Call us today at (830) 257-6577 to see how we can add value to your Texas bulk or packaged lubricants requirements.